The idea of companion planting has been around for hundreds of years, and for good reason. Selecting the right companion plants for your vegetable garden will help you reduce pests, attract beneficial insects, and grow more tasty vegetables. 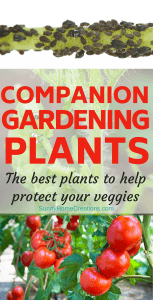 Companion plants are herbs, flowers, and vegetables that are grown together to form a relationship that can encourage natural pest control and fertilization between both plants. Most companion plants also help to attract pollinators that encourage healthy plant growth, leading to a better tasting crop. While some companion planting techniques have been proven by scientific research, other plant groupings are based on wives’ tales passed from gardener to gardener over the years. Whatever their history, these 10 companion plants will definitely benefit your garden. This Native American planting technique is the perfect example of companion gardening. In this traditional technique, you plant corn, beans and squash together in the same row. The corn stalks work to support the climbing beans. The beans draw nitrogen from the air into the soil, which helps enrich the ground for all the plants involved. Finally, the low-growing squash plants provide ground cover to eliminate weeds and keep the soil moist. This traditional herb will be a wonderful addition to your garden. In addition to netting a delicious herb, you’ll protect your tomato plants from hornworms. When planted in close proximity, the root systems of tomatoes and basil actually work together without crowding each other, making them perfect garden companions. The use of basil in your garden will also attract butterflies, while repelling harmful insects like aphids, beetles, mosquitos, and white flies. The adorable wildflower is actually a wonderful vegetable garden companion. Not only does it repel pets, but it also assists in preventing soil erosion. Yarrow is made of a group of tiny flowers, which attracts a host of beneficial insects to the garden. Pollinating bees love the flower because it offers a source of nectar. The flower also brings in insects like ladybugs and hoverflies, which are known to eliminate aphids in vegetable gardens. This aromatic herb is a great companion plant because it is beneficial to so many garden vegetables. Broccoli seems to benefit the most from rosemary because it confuses the cabbage butterfly, one of broccoli’s biggest pests. The smell of this herb is also said to repel a variety of other insects, including bean beetles, cabbage moths, and carrot flies. Companion to: beans, broccoli, cabbage, and hot peppers. The distinct scent of this flower is said to confuse insects, making it a great repellant for beetles, but the blooms work to attract more beneficial pollinators. Their aroma may also work to deter rabbits from entering your garden, while their small blooms help to add a pop of color. Although most garden vegetables benefit from planting marigold, keep them away from beans and cabbage. These tall, brightly colored flowers offer a host of benefits to your vegetable garden. As a companion plant, sunflowers can provide shade to tender plants, like lettuce or spinach. Their bright petals work to attract pollinators and other beneficial insects, while also repelling nematodes. And climbing vegetables can use their tall stalks as a trellis. Dill is beloved by organic gardeners because it offers so many wonderful advantages. Its aroma often draws good insects, like ladybugs and butterflies, to your garden, while discouraging cabbage loopers, aphids, and spider mites. While dill does offer benefits to your garden, it should be kept away from carrots because there’s a chance they could cross-pollinate and stunt carrot growth. The pungent smell of garlic plants helps to keep away a host of harmful insects and other larger garden pests, but its blooms still attract the bugs you want in your garden. On top of driving away a variety of gnats, moths, mites, beetles, aphids, ants, and snails, the smell of garlic also keeps rabbits and deer out. The best thing about companion planting with garlic is the fact that it takes up very little space in your garden. Geranium is another popular garden flower because it’s easy to grow and works as a companion to so many plants. Like most other companion plants, geraniums work to repel common pests, like earworms, cabbage worms, and Japanese beetles, while also attracting beneficial bugs. Plant these flowers along the edge of your garden to deter pests from entering. Many organic gardeners consider comfrey a must-have companion plant in their garden. There are so many different uses for this versatile flowering plant. Its roots serve as a nitrogen provider and its leaves make wonderful compost. Your garden will also benefit from its bright purple flowers, which attract pollinators. Comfrey is another great plant to grow along the edge of your garden to prevent unwanted pests. It can also be used as a sacrificial plant grown around other plants that are susceptible to slugs and snails.